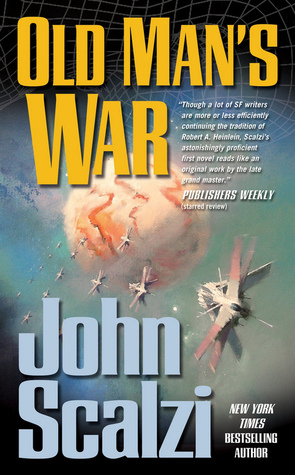 Old Man’s War was a reread, since when I read The Human Division, I didn’t entirely remember all the politics and so on, and decided I’d reread before I read The End of All Things. Besides, Scalzi’s books are good fun, and Ryan @ SpecFic Junkie was reading the books recently and encouraged me to do my reread too. So it was more or less irresistible, and definitely inevitable. Old Man’s War is a fun ride: lightly written, with moments of pathos and depth as well. You get the aftermath of the main character losing his wife, you get the characters dealing with being thrown into a vicious war, you get them dealing with losing friends and comrades… It touches on humanity, what might make you inhuman, and identity. But there’s also plenty to laugh at, and John Perry is always ready with a smartass comment. “How are you feeling?” he’s asked, after a crash which ripped his body practically to shreds, and time spent regrowing his limbs in a tank. There’s also interesting aliens and a wider world glimpsed around the edges, which don’t get dealt with as such here, but which play into later books — human vs alien politics, the situation on Earth, specific alien races which Perry’s units get involved with to a greater or lesser extent… And the Ghost Brigades, which become the main topic of the next book, especially reflect upon identity and embodiment. And I just checked on two people who I knew read both this and David Weber’s Honor Harrington (naming no names on who). Honor is apparently a Mary Sue for being a career soldier who does well in a difficult situation. John Perry is apparently just awesome, and perfectly believable. An ‘everyman’, even. If that’s not ingrained sexism, I’m a bunny rabbit. …Huh, possibly the same for me. Scalzi is great at humour, without going “HAHA IT IS TIME TO BE FUNNY”. I love Redshirts by Scalzi and I do want to give this one a shot. It’s one of my husband’s faves. It’s really fun, I do recommend it!